A very busy weekend for Galway Clinic sponsored local community based soccer club Maree/Oranmore FC with a plethora of club sides in competitive action. The Girls U12 and U16 sides kindly assisted by Oran Precast had good league wins against Athenry fc and Kilshanvey Utd respectively. The u12 girls won 4-0 courtesy of goals from Orlaith Geraghty, Emer Brosnahan and a brace from Holly Conboy as they maintained their top position. The u16 girls had a hard earned 2-1 win in Kilconly last Sunday with a brace from the hardworking Nicole Duffy sealing victory for Tony Jordan and John Brogans charges. Three of the clubs six u12 boys sides were in competitive action with all three winning. The u12 championship side had a fine 2-1 victory against Cregmore/Claregalway fc with Cian Quirke and Caelan Coleman netting. The u12 div 3 side had a well earned 1-0 narrow victory against Craughwell Utd with Miguel Ruiz Tully scoring while the u12 div 4 side defeated the other Craughwell side 1-0 with a fine Noah Dowling goal. Well done to three club players namely Shay Rabbitte, Michael Claffey and Charlie Healy who were part of the Galway and District u12 League side who defeated The Longford League 3-0 away on Saturday last. The u13 div 1 boys defeated Salthill Devon 7-3 with strikes from Ben Trainor(3), Ciaran Mc Donagh(2), Jack Griffin and Alan Mc Carthy. 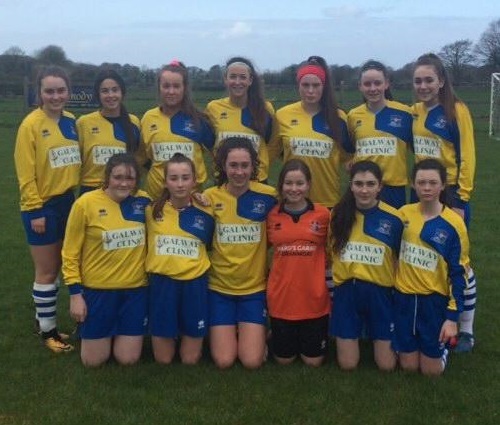 The u15s exited the Galway Cup away on Saturday last to Cregmore/Claregalway fc. The u17/u18 Div 2 side travelled to Na Forbacha for a League tie against Bearna Na Forbacha Aontaithe and came away with an excellent 6-0 victory with a brace from Mark Mullins with further goals from Jason Meehan, Diarmuid Hanniffy, Jack Burke and Patrick Ugbade. This was a fine team performance by the lads on Sunday. The clubs Adult Premier Team played well in the second half in the League but went down 3-1 to Athenry fc with an excellent Chris O Dowd strike bringing the game back to 2-1. The lads are competing well in the top flight under Don O Riordans leadership and have four League games remaining. The Adult Reserve side had 5 u21 players starting and they defeated Corrib Celtic on Saturday last with two penalties from Mike Lafferty and a James Cahalane strike adding to the tally. The St Columba's Credit Union Invitational Tournament continued last sunday and for the coming Sunday March 31st its the turn of u7 and u8 boys and u8 and u10 girls from all participating clubs. The u11A boys welcomed visitors St Josephs fc from Athlone in a series of games while the u10 girls played a very enjoyable blitz hosted by Colemanstown Utd on Saturday morning last.